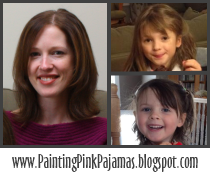 Last month I was lucky enough to win a contest on Because Babies Grow Up - for a CD! 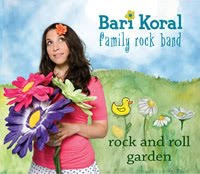 Rock and Roll Garden by the Bari Koral Family Rock Band is a great addition to our children's music collection. Although it's about child-friendly topics, the songs have a good beat, which makes Mummy & Daddy very happy! I think the song "Hey Ducky" is super cute, and C loves "The Backpack Song". Whenever she hears it, she goes running to get her own backpack. There are a couple of fun action songs on the CD too, and for urban dwellers, "Subway" is really cute. You can listen to some song clips on BariKoral.com, and the CD is available on Amazon.com (but not Amazon.ca yet!). Another CD that I just discovered is A Family Album by The Verve Pipe (Remember "The Freshmen" on top 40 radio in the 90s?). I haven't played it for C yet, but I've been enjoying it! So far my favourite songs are "Complimentary Love", "When One Became Two" (about having twins), and "Be Part of the Band" (about different instruments). I downloaded the album from emusic.com (my favourite digital music site), but you can download a digital version the CD from Amazon.com or order a hard copy from The Verve Pipe website. You can also preview the entire album on their website - check it out! these look like great CDs I will totally have to go check them out!!! haha about the verve pipe, I sure do remember the freshman song!! Thanks for posting these! Any kids music that doesn't make me want to poke my eye out with a dull knife is a plus in my book! We love Putumayo CD's too... They have some great songs. It sounds like a lot of fun music! I'm getting kinda tired of Kidz bop!! Oh these sound so great! I can't wait to find them, we are really into music lately and I love all the great children's music out there. Thank you for sharing this! I was just thinking about The Verve Pipe this week. I'll have to check out their album. Sounds great.